Has anybody done this ride? Suggestions for places to camp? You could follow the MS150 route. They don't camp out but the roads would be the same. Thanks. Someone else told me about the MS 150. I looked into it. Apparently its route moves around. The official link is, I think, www.ms150.org. In 2018 that led to the BP MS 150, running from Houston to Austin. My searches for maps or routes for the previous years aren't turning up specifics, other than one page that says AT&T Center to Beeville to Texas State Aquarium (map link). I see that route uses U.S. 181 rather than 281. Google Maps doesn't mark either as bike-friendly. I'm guessing they rope off the route or otherwise alert motorists. Any idea whether one or the other would be safer for a solitary rider? It looks like there are segments on both that have shoulders. The Bike to the Beach MS150 has not happened for several years. I suspect the reason was sponsorship changes by HEB. Looking at this Strava.com heat map may help you see where other cyclists ride. I put this together dreaming of Adventure Cycling one day offering a trans-USA, ocean-to-ocean short route, beginning at the pier in San Diego's Pacific Ocean and branching off the Southern Tier in Central Texas, running to the pier in Corpus Christi's Gulf of Mexico. I tried to stick to small, paved county roads out through the countryside, but just as in a few other parts of the country (and Adventure Cycling's own routes) there's a dearth of roads and in a few places I've routed down I-37, but, and it's a big but, in this part of Texas that means riding on the entirely separate access/feeder/frontage road that runs parallel to the Interstate highway rather than on the Interstate's shoulder. There are city and state parks for camping and a collection of motels, but it's kind of a low population part of the country so plan ahead. My route crosses the Corpus Christi Harbor Bridge. 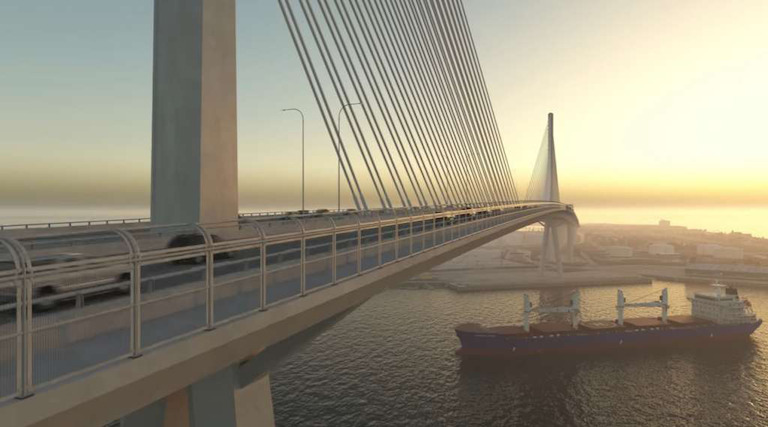 In 2020 a big new cable stay bridge will open with a barrier separated, latest-and-greatest compliant bicycle and pedestrian lane. Until then, the only crossing is the 1955 steel arch bridge. Bicycles are forbidden to use this bridge, but, and it's a big but, Corpus Christi city buses make the crossing on a frequent schedule and have bike racks. Those are interesting routes. I've added comments to your maps. I didn't know the CC bridge was completely off-limits to bikes. Camping options seem to be pretty limited. I've developed a route map and detailed writeup using sites listed on FreeCampsites.net. I've added links to your routes from that writeup. I wondered how long your route was, from the south side of SA down to CC, but I couldn't figure out how to modify for that purpose on the Ride with GPS website. Every cycletourist has their own likes and dislikes. On my route I tried to optimize pleasant miles ridden. I understand that is not everyone's primary requirement. I see the Texas Bicycle Tourism Trail being developed by the state department of transportation just routes down four lane US181. Fun fact: the John Kennedy Causeway was originally a toll bridge. Cyclists paid 10¢ to cross! Camping: Similar to sections of Adventure Cycling routes, every little town on my Third Coast route has a city park and a well kept Catholic and Baptist/Methodist church. I don't see a cycletourist going without a spot to put their little tent down. I will point out, though, this area of the country is currently in the midst of a fracking boom. These days many of the established camping areas are completely filled with the trailers and RVs of oil field workers. On my Ride With GPS Third Coast alternative map, Loop 410 on the south side of San Antonio is at mile 105. Downtown Corpus Christi is at mile 290. My improved route across San Antonio uses quiet residential streets, streets with bike lanes and grade separated bike paths - and remembers to go by the Alamo. Correction noted re JFK vs. Harbor bridges. Optimizing pleasant miles ridden is a worthy philosophy. So is optimizing campsites. I will have to look at your route more closely. The mileage doesn't seem much more than what I had in my Hwy. 281 route, and it sounds a lot better. Learning another new thing for the day, I wasn't aware of the Texas Bicycle Tourism Trail project. A quick glance says they have tentatively adopted the old MS 150 route to CC. I wouldn't rely on bike lanes in SA unless they are walled off. Even aside from the broken glass and other crap, we have a major problem: too many Texas drivers -- some not paying attention, some with issues. I appreciate your effort to find quiet streets, but Blanco, Rittiman etc. aren't that. Not to quarrel with you; just for the information of others making the attempt. Your effort is worthy: not everyone is going to be willing and able to find a way to the bus stops, or to ride through at 3 AM. I think in CC I'd probably just take the bus from the city limits across the causeway to Padre Island. But it's all speculative now. We'll see what develops. For the information of others making the attempt, San Antonio's Blanco Rd and Rittman Street have marked bike lanes on the sections I've utilized. IMO if a cyclist isn't comfortable riding on such urban streets, they will be extremely uncomfortable attempting a tour using US highways (the speed limit on typical rural Texas highways is 75mph). Hypothetically a cyclist riding Adventure Cycling's Southern Tier cutting off on my Third Coast Alternative would have ridden across San Diego, Phoenix and El Paso before arriving to ride across San Antonio and going on to ride across Corpus Christi. I'll stack my city crossings up against those cycletourists are already safely and enjoyably accomplishing on the Southern Tier. Not sure what else to say. It looks good on paper. But I've been riding here for five years. You might want to check the statistics on riding "safely" in Texas. But I've been riding here for five years. Fair enough, pardner. I've been riding in Texas since 1962. When's the last time you biked through San Antonio?